As mentioned in my 2015 goals, one of my big goals is a less specific "General consolidation of stuff / updating / completing various systems (go-to AR, battle rattle, EDC, etc.)." A commenter asked for specific plans r.e. the AR-15, so here goes. The upper has been 100% reliable through the variety of ammo that I've run through it and ~8 years of use, but it's also pretty outdated, and I find that the carbine-length handguards put a limitation on adopting a more modern grip. I've had a more up-to-date AR on the back burner since literally the last election cycle (pre-Sandy Hook). I tend to have 1 or 2 major firearms related purchases in finances per year, I decided 2015 was 'bout time to get AR upper done. Prices and availability are not going to get any better, that's for sure. Current plan, as it stands, is a BCM lightweight BFH 14.5" Mid-length with their 13" KMR rail. 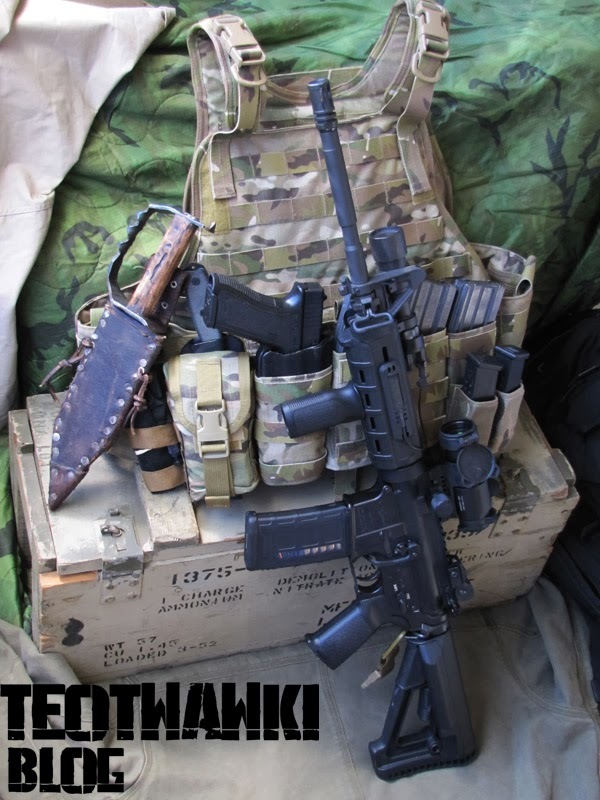 Likely the BCM "tactical" gunfighter comp, perma-pinned. That should bring me pretty current in terms of AR-tech, da? Why BCM? They're pretty universally well regarded as high quality, go-to level stuff. You can save a few hundred bucks going with other brands, and you can spend several hundred more going with others. I'm concerned with having something that I can put confidence in right out of the box, and BCM is one of the brands that I'd put that trust in. They also do a lot of cool marketing, collaborations and support for the firearms industry as a whole, and I don't mind supporting that, either. Why 14.5 inches with a pinned comp? It's the shortest you can get without either getting into an SBR or the now questionable AR pistol / SIG Brace territory. Moving indoors and in vehicles is a part of life, and having a maneuverable gun helps make that a bit easier. The downside is that it makes switching out muzzle devices harder, though a capable gunsmith can cut off a pinned on comp if a change is needed down the road. Why mid-length? Longer gas system = lower pressure slamming through the direct impingement system, less wear and tear and softer recoil impulse. Why the KMR rail? Ridiculously light weight for a full length rail, super strong, and direct mounting of tacticool accessories via keymod. Does look a bit like hardware store shelving, though. Why the gunfighter comp? It's a combo flash hider and compensator, so you get goodness from both worlds. Looking at other options as well - nothing being set in stone at this point. I might go for a 16" barrel, different rail, different comp, etc. Arranging federal reserve notes now. Will make the purchase within the next month or so. I'm undecided about what to do with the Stag upper - it will be collecting dust in the safe after new upper arrives. The minimalist don't have excess stuff part of me wants to sell it and roll said funds into the purchase of the new upper. I'm not the type who wants lots of average firearms...I want a few, trusted and higher quality ones. The extra cash to dump into the new project would be welcome. Survivalist side of me has me holding onto it for a backup / hand out. I have extra lowers hanging out, so it's a complete carbine with a good track record. Not bad to have around. And the cheap side of me says scrap the new upper, just dump a couple hundred bucks into the current upper to modernize it a bit. New hand guards/rail, maybe free float it, and a few other enhancements to bring it more up to speed.